Sandy Tolan’s book about freedom and conflict, determination and vision, and the potential of music to help children everywhere see new possibilities for their lives. It is an unlikely story. Ramzi Hussein Aburedwan, a child from a Palestinian refugee camp, confronts an occupying army, gets an education, masters an instrument, dreams of something much bigger than himself, and then, through his charisma and persistence, inspires scores of others to work with him to make that dream real. The dream: a school to transform the lives of thousands of children – as Ramzi’s life was transformed – through music. Musicians from all over the world come to help. A violist leaves the London Symphony Orchestra to work with Ramzi at his new school, Al Kamandjati. An aspiring British opera singer moves to the West Bank to teach voice lessons. Daniel Barenboim, the eminent Israeli conductor, invites Ramzi to join the West-Eastern Divan Orchestra, which he founded with the late Palestinian intellectual, Edward Said. 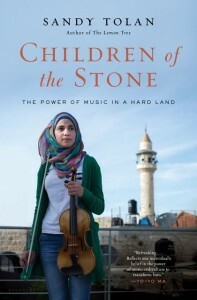 In Children of the Stone: The Power of Music in a Hard Land, Homelands co-founder Sandy Tolan chronicles Ramzi’s journey – from stone thrower to music student to school founder – and shows how, through his love of music, he created something lasting and beautiful in a land torn by violence and war. This is a story about the power of music, but also about freedom and conflict, determination and vision. It’s a vivid portrait of life amid checkpoints and military occupation, a growing movement of nonviolent resistance, the prospects of musical collaboration across the Israeli-Palestinian divide, and the potential of music to help children everywhere see new possibilities for their lives. For book tour information, articles, excerpts, and other resources, visit Sandy’s author page on Facebook or his blog, Ramallah Cafe.